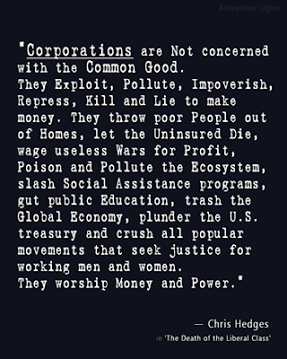 After seeing this infographic quoting Chris Hedges, it really hit home and I was able to focus clearly on how much we have morphed into a full-fledged Coporatocracy. Corporatocracy is a term used as an economic and political system controlled by corporations or corporate interests. Corporatocracy means being ruled by an oligarchy of corporate elites through the manipulation of a formal democracy. After the Supreme Court’s decision in the Citizen’s United case, the morphing of the America into a Corporatocracy is complete. Our nation’s most wealthy individuals (1%) are the ones who hold prominent positions in our new Corporatocracy. Through their corporations and political action groups they control the process of determining our nation’s economic and political policies. What we have now is outright worship of obscene profits and power for those who have purchased all the politicians, and who control every facet of our once nearly free society. Corporations don’t care about helping America succeed. Corporations exist solely for profit, not public good. If the government stands in the way of their profit potential, they can legally purchase new politicians through unlimited, undisclosed campaign donations. If the salaries of their employees stand in the way higher profits, they’ll eliminate them because they are willing to send millions into poverty just to appease an economic system that values wealth at the top over all else. We now live in a system full of collusion, corruption, and oppression by the extremely wealthy (1%) and their bought-and-paid-for political puppets who enable this unrestrained greed of corporate and financial titans (i.e. bank bailouts, excessive pay for CEOs). Our government has become a subsidiary of industry. This entry was posted in Inequality and tagged Citizens United, Coporatocracy, Corporations are people, Dark Money, Greed, Inequality, Money and Politics by Larry Shivers. Bookmark the permalink. We’re all often separated by partisan players, I would say that I’m on the right of many political issues, and a friend of mine will tell you he is on the left. However, when he and I speak of issues for hours at a time we can often find many ways to compromise and to see each others points of view, and with that being said we have discussed the matter of Corporatocracy. He believes in many regulations whereas I believe in more freer market, yet I do see the value of regulation. He makes the claim the founders had great foresight but couldn’t possible have imagined corporate America as it stands today, which is partially true, but as I am a student of the constitution, I enlightened him to much of his surprise that the founding fathers were indeed fearful of corporations, as in the beginning of the nation they had expiring charters, deal with only one commodity, and not hold other company’s stocks. I call it, Plutocracy….same effect….just a different use of words.